I can’t recall a time over the past fifteen years where the next five years in the world of search engines and SEO seemed as clear and obvious as they do today. Nor can I recall a time when so many experienced professionals and smart companies buried their heads in the sand about it… (maybe the very early days when too many organizations ignored the power of SEO because of its black hat reputation? But even that’s debatable). That does not mean that investment in SEO is going away anytime soon. In fact, it may be that SEO as a profession and industry has 10-20 years of heavy growth left. After all, there’s basically no one else on the web sending out any decent quantity of traffic — it’s Google or nothing. And, most marketing channels historically earn dramatically more investment as they mature and plateau. The golden age of brand advertising ROI might have been the 1960s-1980s, but investment in those channels peaked a couple decades later (both as a whole and as a percent of economic spend). Sadly, I see very few folks who have this equation thoughtfully baked into their marketing strategy. 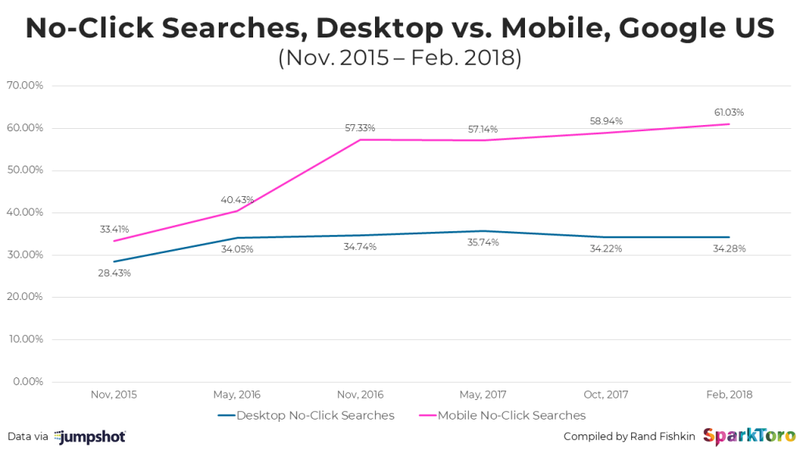 Realistically, we should see marketing dollars and effort already moving to demand generation, and SEO tactics at least partially shifting to on-SERP SEO, growing branded search queries, turning more visitors into email subscribers, PR, and other forms of digital audience influence. Arguably, one could say that the rise of influencer marketing is a reaction to this, but I don’t think that’s the reality. Instead, my perception is that the influencer field’s growth is an outcropping of what was called “social media marketing” a few years ago (and it’s bizarrely overindexing on half-naked Instagrammers). p.s. I actually think this is good news for tool companies like Moz (and its competitors – Ahrefs, SEMRush, etc), as monitoring SERPs and the link graph will only grow in importance as Google removes the traffic websites earn from their results.